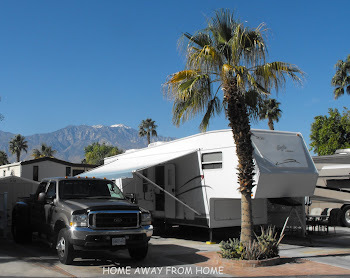 We love RVing so much that we are on our 2480 km (1550 mi) detour into the USA. Next morning, we followed #85 south on a cloudy morning. The local time is Central but we go back into Mountain Time later in the day. We decided that we’d follow ‘Our Time’, a new time zone. ‘Our Time’ is we sleep when we’re tired, ‘Our time’ is we eat when we’re hungry and ‘Our Time’ is we stop driving when we’re ready. One of the benefits of retirement and rv’ing, we’re in our own world and our own time zone !. The terrain in N. Dakota south of Williston is a lot of rolling hills so there are a lot of ups and downs in the roads but they’re fairly straight. We crossed the Missouri River, although I wasn’t ready with my camera, and that was pretty. There are oil rigs scattered through out the state. Right in the middle of a harvested field there will also be an oil digging operation. We’d seen lots of them in Saskatchewan and they started appearing in the Dakota’s, too. We dropped down into the valley of the Little Missouri Scenic River and saw the most beautiful Theodore Roosevelt National Park. I took pictures from the truck then stopped at the viewpoint for more, these pictures do not do justice to the scenery we saw. Too many clouds make it so dark and they lose color in the photo. Once we crossed the bridge we were entering the Little Missouri National Grasslands, and we had to stop for more pictures. Beautiful. We had seen several different crops in the many fields we’d seen thru the Canadian Prairies and down thru the States, but none surprised us more than the fields of sunflowers that we saw. Stopped to have lunch in the RV at Amidon, ND. They had a police car with a dummy in it parked roadside at the north end of the tiny town. There was a speed limit calculator there showing your speed. The real police had someone pulled over the other end of town, a block away. The town consisted of some vacant buildings, making it look like a ghost town and with the dummy police in the car, could have been a movie but it obviously worked for catching speeders ! We entered Wyoming twice. Once because we were on the wrong highway, and drove into Montana, so we took the next turn and we were back into Wyoming. (It gave me two chances to get a picture of the sign welcoming us into Wyoming and I missed them both.) It added about 20 miles to the day but it also had us driving thru such pretty country and the sun had come out by then. We could say it was intentional in order to say we were in Montana, but we had done that the day before when we drove from Saskatchewan to Williston, ND. When we got into Wyoming, the range was so pretty with the sun shining, I told Keith I had this desire to sing “Home on the Range, where the deer and the antelope play” that was going around in my head ! Then within minutes, and I am not kidding, we saw some antelope in the field. Not 2 minutes later, we saw some deer ! And basically all we’d seen all day to that point had been cattle. That is one of the strangest coincidences I have ever had. 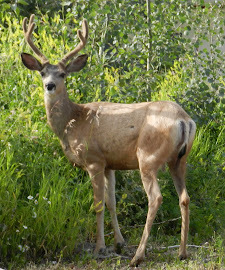 On that same Hwy 112, we saw so many more deer we wondered if they were farming them. At home we might see two or three together, here we were seeing herds of them. We also saw wild turkeys a couple of times. We’d seen buffalo earlier and I did not get one picture of any of these animals, we were driving and weren’t able to get a photo.